If you’re a mom, you’re working. You may do it at home, you may do it at home and at an office, but you’re working. Virtually all the time. You may be knee-deep in diapers and nap scheduling, or maybe you’ve moved on to shuttling to school, practice, doctor appointments, or maybe you’re trying to figure out what the heck goes on inside the mind of a teenager. But you’re there, working, in the thick of it. And you probably (because you’re reading a wine blog) think about wine. Possibly often. Possibly even before happy hour. The connection between wine and motherhood is everywhere. It’s like an inside joke between every mother who has called it “mommy juice,” or talked about “wine that tastes good in a sippy cup.” The Facebook page “Moms who need wine” has over 683,000 likes. That’s 683,000+ moms who can relate to wine as a necessity in their role as mom. So do we NEED wine? Makes us all sound a bit lushy, doesn’t it? It’s not really the wine we need. It’s definitely part of it, but wine reflects a lifestyle and that’s what I think moms need. As a company, we try to promote the wine lifestyle through inno vation. As a mom of 3 young girls (5 and under), the wine lifestyle means slowing down. The end of the day is a time to unwind, decompress and relax, whether it’s from being at an office or herding kids. Or both. And I (and others) like to do that with a glass of wine. Beyond the calming effects of the alcohol, those sips are about taking time away from frantically picking up or unpacking school stuff. It’s about slowing down and taking a break. With the kids, without the kids, over dinner or in a bath. 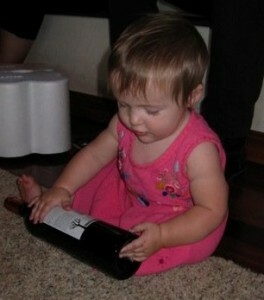 Wine helps us enjoy life, and more than anyone, Moms need to remember to do that! So when you “need” wine, remember you really need to slow down. Sip and savor the wine. And your crazy, busy, joyful life. So Happy Mother’s Day to all the moms out there! I hope you celebrate with a delicious glass of wine 🙂 And if you have a mom, go get her a nice bottle! She needs it. Previous PostWine should not be so difficult: A trio of great values!Next PostWorking Moms in the Wine Industry: Happy Mother’s Day to all of you!